Nothing much to post, I have been working these past few days and not doing anything much else. Today I have the day off and I am clearing up my house. The usual things. The livingroom is tidy again and I've sorted out my flowers. I love ranuncles but they drooped down after a couple of days. So I snipped them short and made (together with some gerbera) a feature out of them on my coffeetable. I also finished two new cushions for my sofa last week. I nearly forgot about that. 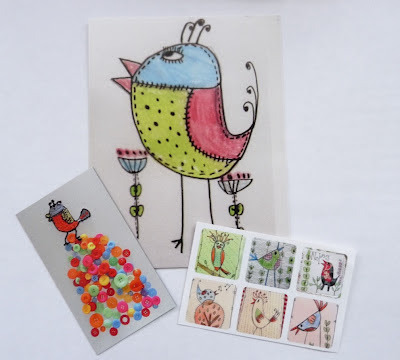 Nice stickers and a magnet with her wonderful Doodly Birds on it.. Little treasures! On the crochet front nothing big either. 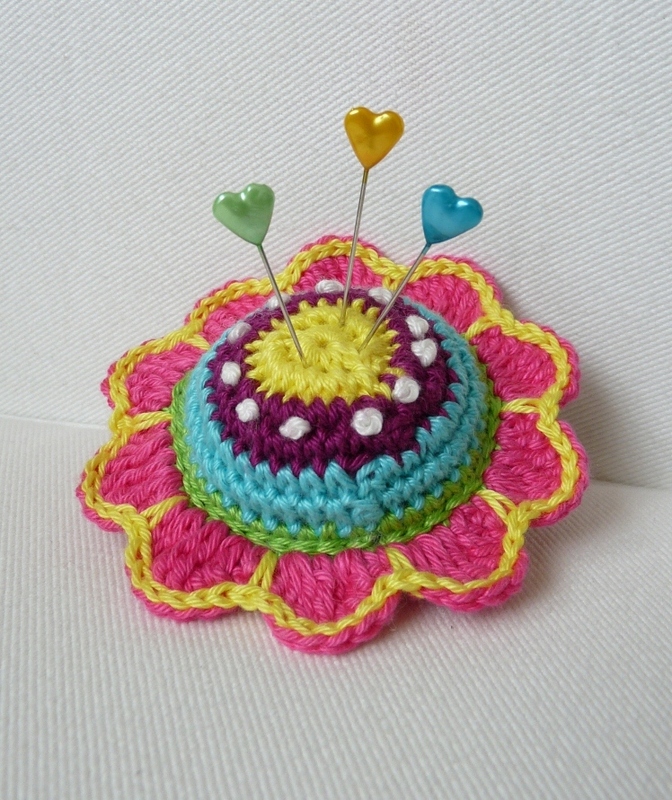 Altough I made two pincushions. 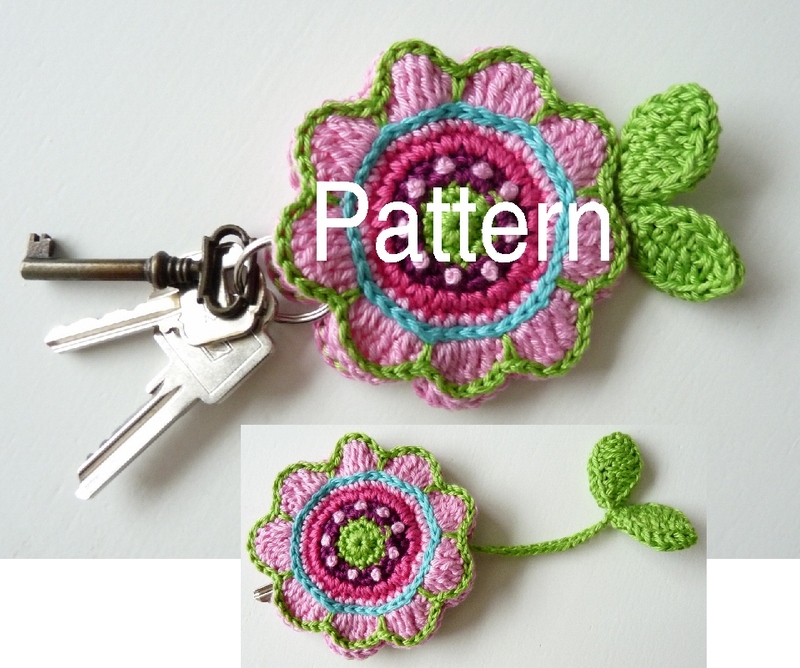 They are similar to the Key Cover pattern, but I adapted it slightly bigger. Well, for someone who had nothing much to tell I filled up my post rather nicely! Thank you Adrianne for the very kind mention. Ive put a couple of links to you today when Ive been looking through the WOYWW blog (whats on your workdesk wednesday), telling them about your gorgeous crochet. Enjoy your day in your wonderful home. ps. the new baby has arrived 7.8lb and her name is spelt the same as yours. So she is Evie Adrianne Taylor. Thanks for the mention too! And thanks for telling me about the new arrival. Evie is also a wonderfull name. Amei seu blog, tem trabalhos lindos! Busier than you thought then! 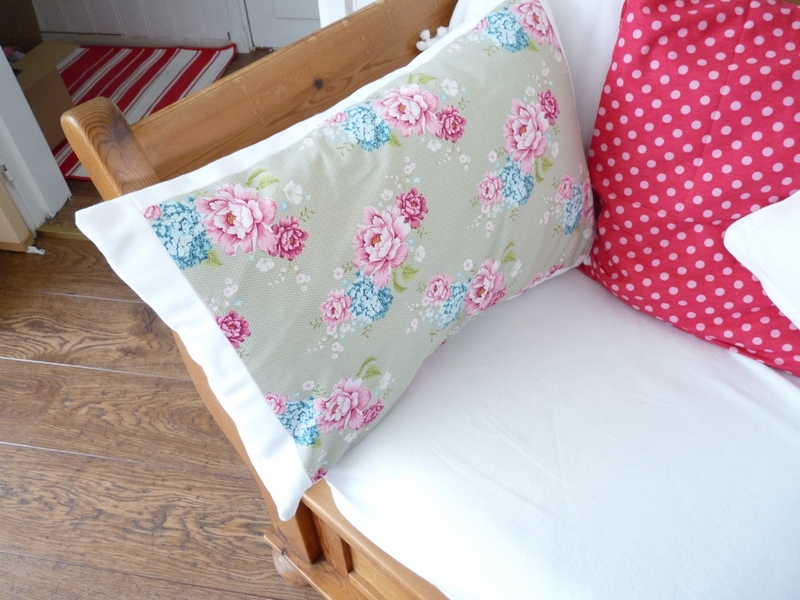 Those cushions look great as do the snipped flowers, something I do too as I can't bear to throw flowers away when they droop! 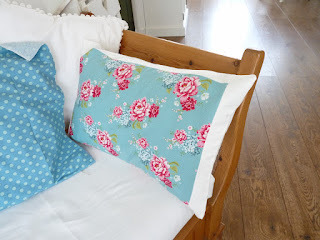 I've just found your blog while browsing through Lynn's at One I made Earlier. 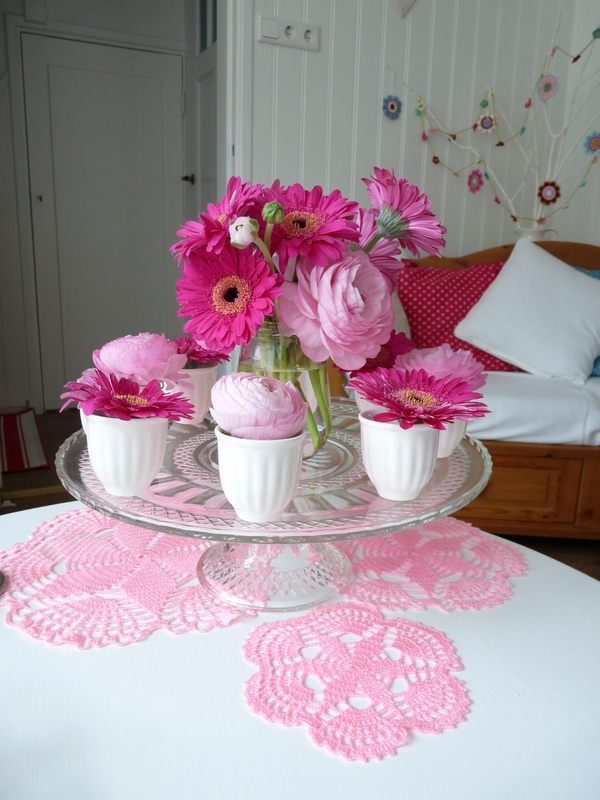 I just love your use of the cake stand for the flowers - really beautiful and stylish. I also love the crochet - so pretty. 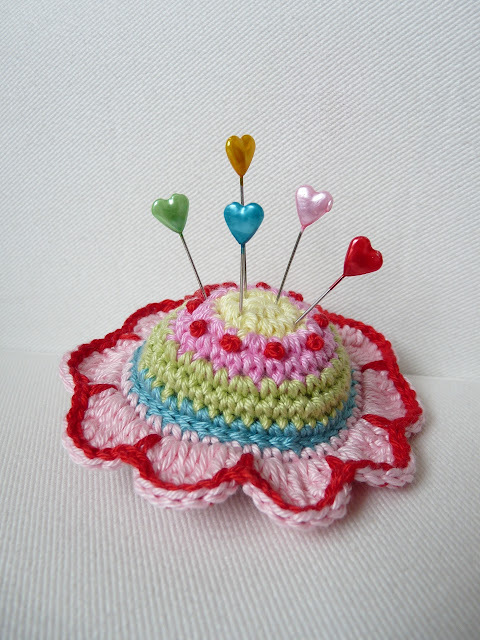 My grandmother taught me to crochet when I was a child but I haven't done any for years - you have made me want to get my crochet hooks out and have a go (if I can still remember how to!). 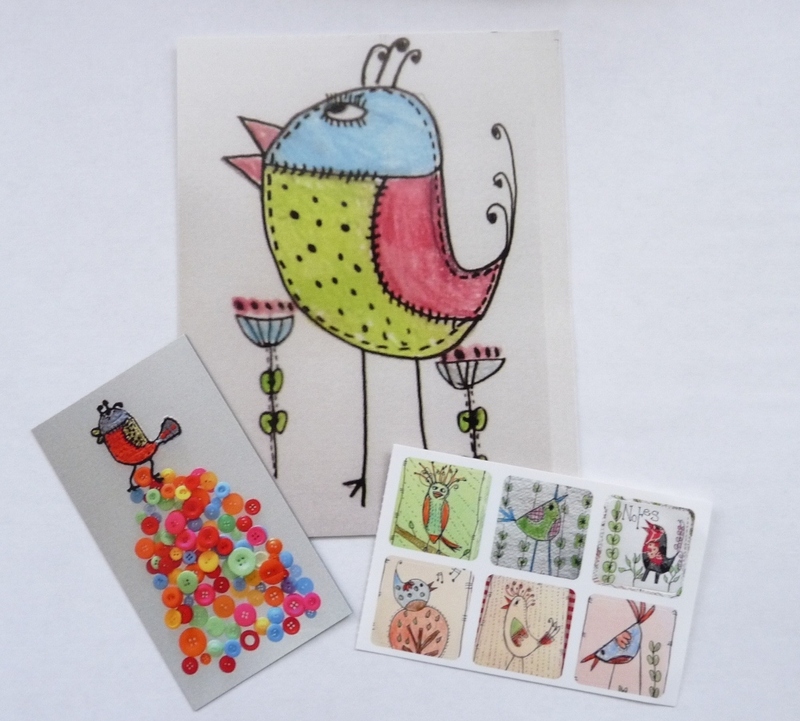 It's been so nice visiting your blog - I'm sure I'll visit again soon.